Within Teamwork Projects, when viewing the Gantt chart, you can change both how it looks and functions. To view settings, click Settings to the top of the page to view the various options in the pop out window. At the top of the settings quick view, you can enable. Auto Save - If enabled, the application saves any local changes every 5 seconds. If disabled, you will need to save the changes manually, using the Save Changes button in the top right of the Gantt view. The option you choose only applies to yourself but will be the same across all projects you can access. Each user sets their own preference. Skip Weekends - If you choose to enable this, weekends will be hidden within the Gantt chart. 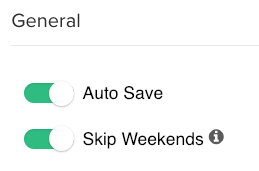 Once you enable skip weekends you will also see a warning if you have tasks or milestones landing on weekends. Note: While the tasks will be shown to fall on weekdays in the Gantt chart, the actual start and due dates of the task will not be altered unless you click Save Changes. You can also choose what task properties are displayed in the Gantt Chart. Show item name - Shows or hides the task, task list and milestone names on the chart. This will only apply to your own view. 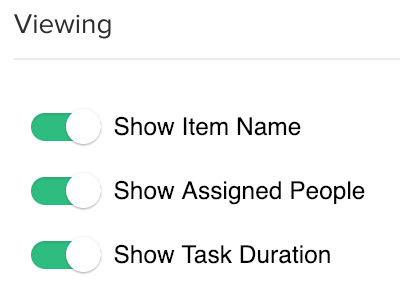 Show assigned people - Shows or hides the people assigned to a task or a milestone on the chart. This will only apply to your own view. Show task duration - Shows or hides the task duration's on the chart. This will only apply to your own view. You can select how the tasks should behave when dragged, and determine how other tasks are adjusted, when one task is moved or resized. Tasks that are related via dependencies will be grouped together when moving. Push all - All visible tasks related by a dependency move together by the same amount. Modifier key: Alt. (Ctrl+Alt on some systems such as Ubuntu). Push some - The visible tasks related by a dependency are updated, if it’s necessary to avoid date conflicts with the other tasks. Push none - No other tasks are affected when one is moved or resized.